(NaturalNews) Apparently overburdened with having to police the filthy factory farm industry in accordance with the law, the U.S. Department of Agriculture (USDA) has decided to simply hand over the inspection reigns to processing plants themselves, according to new reports. Updated "food safety" guidelines will soon entrust poultry processing plants with the responsibility of conducting their own food safety inspections, which means more feces, Salmonella and other contaminants in factory food. The new USDA rules were hailed by Agriculture Secretary Tom Vilsack, a vocal proponent of factory farming and genetically modified organisms (GMOs), as some kind of boon for food safety. The former Iowa governor told reporters that having poultry processing plants police themselves, rather than be inspected by third-party auditors, will result in food being safer than ever. The new rules "will increase the chances of us detecting problems by placing the burden of finding [contaminants] such as salmonella on the plants," he stated, in complete seriousness. 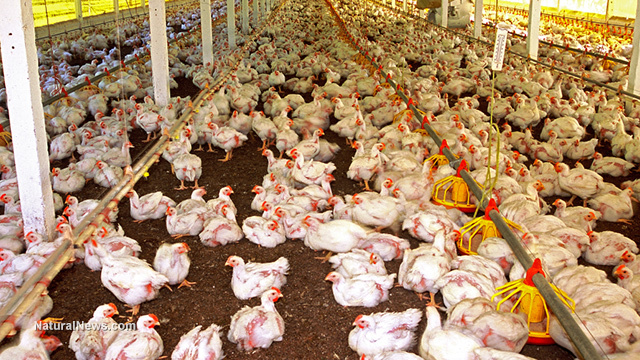 Currently, the USDA's Food Safety and Inspection Service (FSIS) periodically places auditors on poultry plant processing lines to look for defective birds, feces and other public health threats in order to snag them before they end up at the grocery store. On average, government poultry inspectors track 130 birds per minute, an amount that makes it close to impossible to fully inspect every single bird. Under the new rules, not much will change concerning the speed of these inspections, except that, now, company employees, rather than government employees, will be responsible for tracking defective or filthy birds. This is an obvious conflict of interest, as companies will be incentivized to let filthy birds pass through in order to cut costs and maximize profits. "With the poultry industry standing to gain financially due to increased production and fewer regulatory requirements, the plan is a gift from the Obama administration to the industry, one that will undermine consumer and worker safety, as well as animal welfare," reads a statement issued by the consumer watchdog group Food & Water Watch (FWW), which opposes the new guidelines. The USDA did lower the number of birds that can legally pass through the processing line from 175 to 140 per minute, addressing concerns that anything higher is impossible to monitor. But FWW says that this isn't enough and that it will still put workers and consumers at risk. "This is not a meaningful victory because there are not accompanying worker safety regulations to deal with the musculoskeletal disorders and other work-related injuries that both the plant workers and USDA inspectors suffer every day working in the poultry slaughter plants," adds FWW. "In addition, the one USDA inspector left on the slaughter line under this new rule will still have to inspect 2.33 birds every second -- an impossible task that leaves consumers at risk." Prior to issuing the final rule, whose effective date is October 20, 2014, the USDA had received more than 175,000 public comments in the Federal Register, most of which were opposed to its provisions. Since that time, multiple petitions have been sent to both the USDA and the White House recommending that the rule be rescinded and that stronger inspection guidelines mandating third-party auditing and inspections be enacted in its place. "This rule means fewer USDA food safety inspectors in poultry slaughter facilities, which is a recipe for more foodborne illness and more people in the hospital," stated Representatives Rosa DeLauro (D-CT) and Louise Slaughter (D-NY), both of whom had hoped for more stringent inspection guidelines, as quoted by Food Safety News.